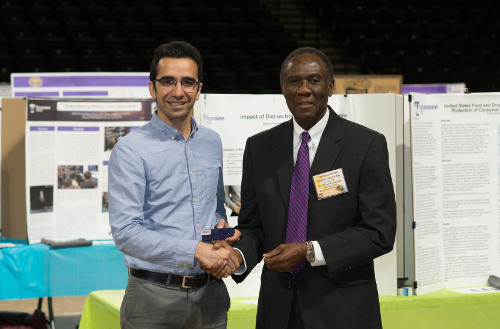 DSSL PhD student Mohsen Safaei received the Best Poster Award for graduate research in Mechanical Engineering, and DSSL undergraduate researcher Robert Ponder received the Best Poster Award for undergraduate research in Mechanical Engineering at the 2017 TTU Research and Creative Inquiry Day. The awards were presented by Dr. Francis Otuonye, Associate Vice President for Research at TTU. Mohsen presented a poster entitled ““Smart Knee” – Instrumented Total Knee Replacement with Piezoelectric Transducers,” and Robert presented a poster entitled “Modeling and Prototyping of Artificial Knee Joint for Embedded Piezoelectric Transducers” Congratulations Mohsen and Robert! 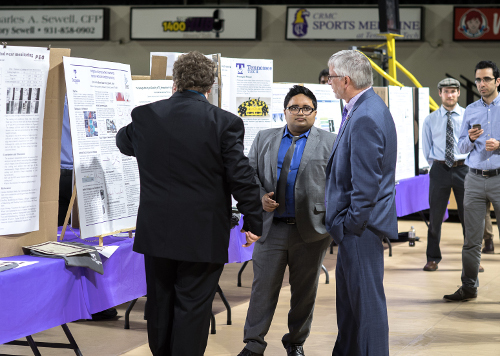 TTU President Dr. Philip Oldham also stopped by to chat with DSSL researchers Ryan Kettle and Ekramul Ehite regarding their poster entitled “Investigation of Alternative Electromechanical Impedance Method for Condition Monitoring”! © 2018 Steven R. Anton.